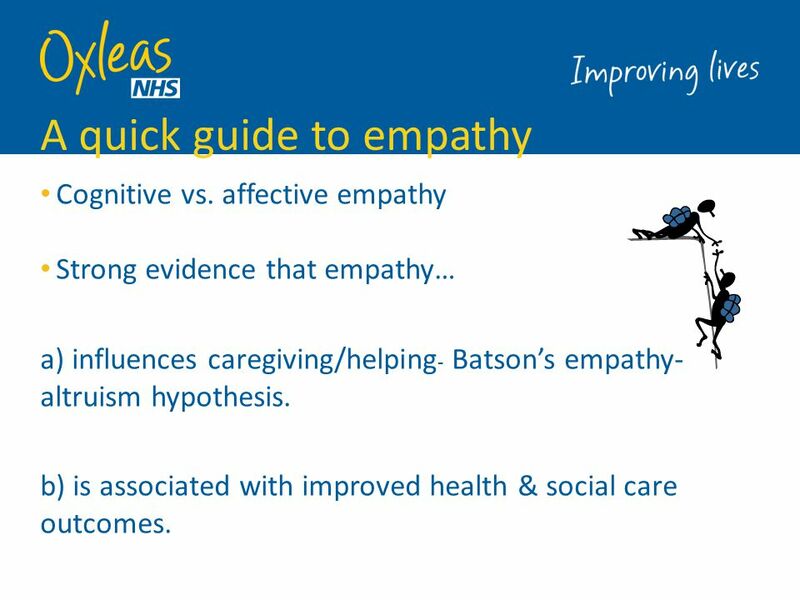 Cognitive vs. affective empathy Strong evidence that empathy… a) influences caregiving/helping- Batson’s empathy-altruism hypothesis. b) is associated with improved health & social care outcomes. 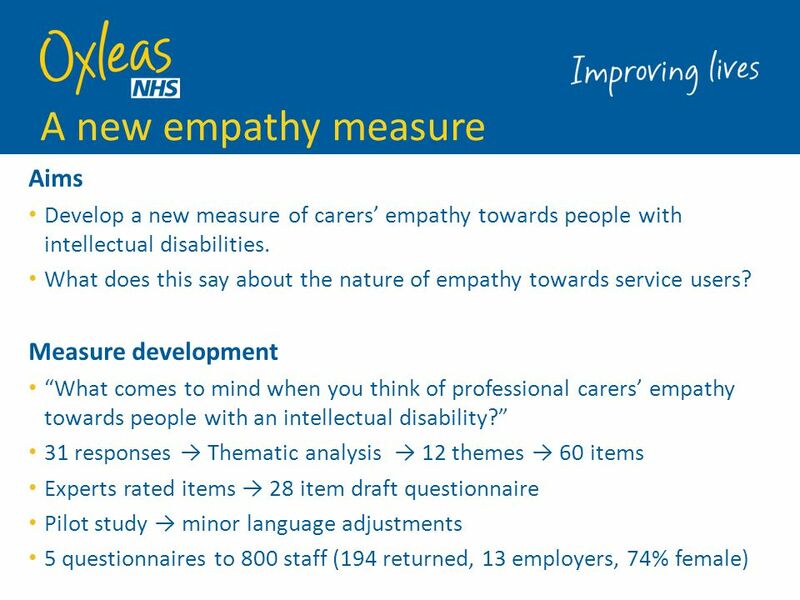 People with intellectual disabilities (‘service users’) value empathy (Clarkson et al. 2009; Dinsmore & Higgins, 2011; Roeden et al. 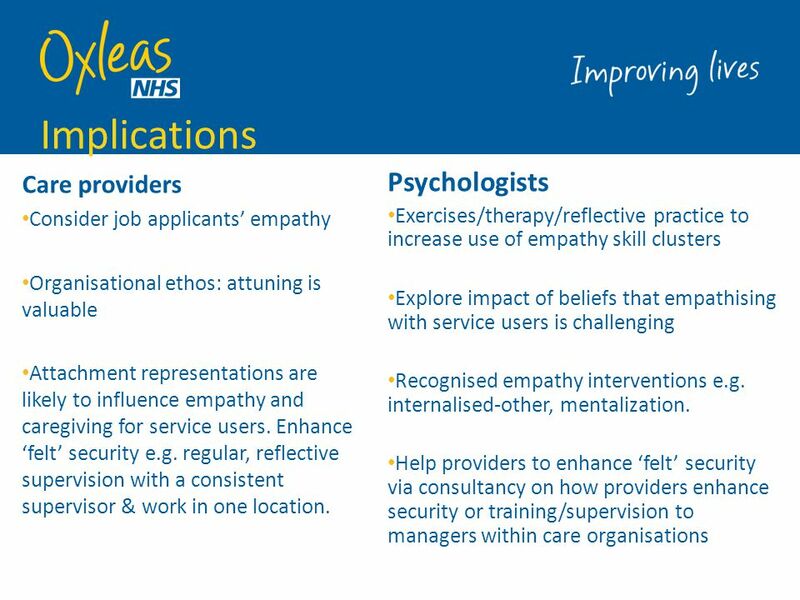 2011) Staff offer key emotional support (Forrester-Jones et al. 2006) given small relationship networks. Relationships with staff become important (McVilly et al. 2006). 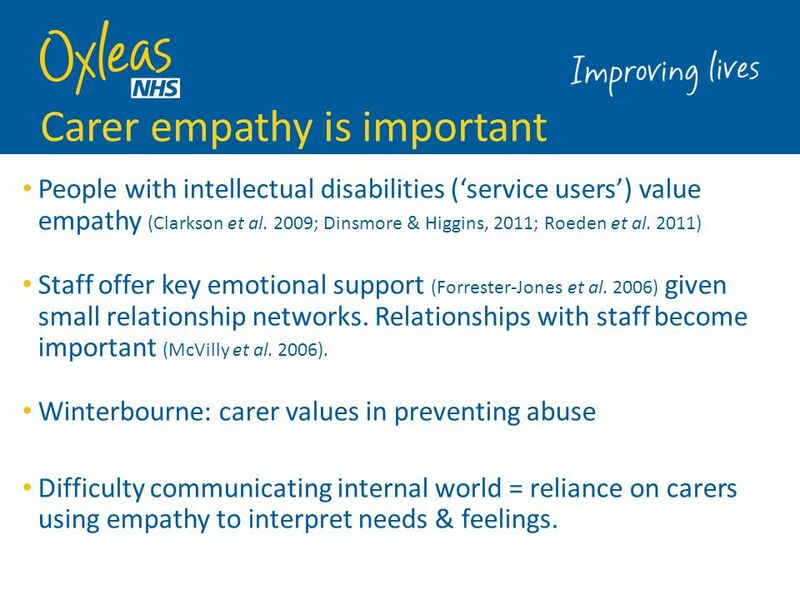 Winterbourne: carer values in preventing abuse Difficulty communicating internal world = reliance on carers using empathy to interpret needs & feelings. 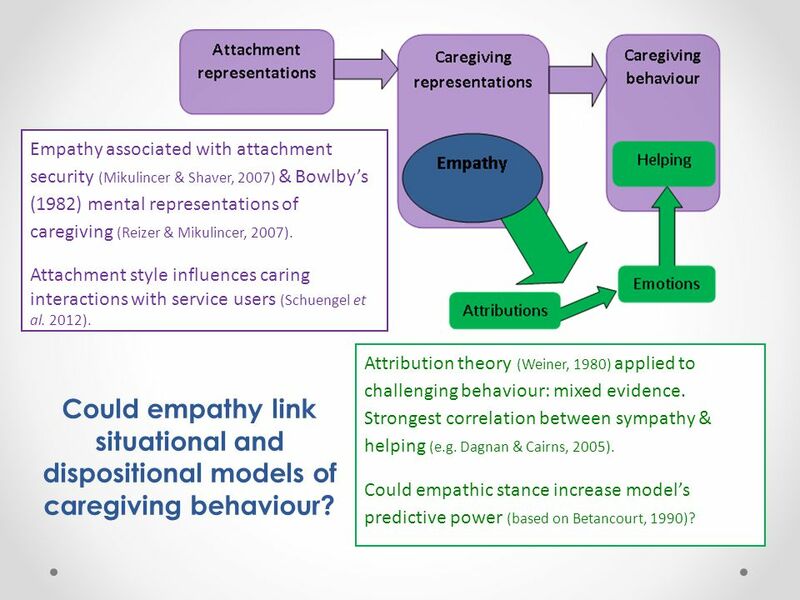 4 Empathy associated with attachment security (Mikulincer & Shaver, 2007) & Bowlby’s (1982) mental representations of caregiving (Reizer & Mikulincer, 2007). Attachment style influences caring interactions with service users (Schuengel et al. 2012). Attribution theory (Weiner, 1980) applied to challenging behaviour: mixed evidence. Strongest correlation between sympathy & helping (e.g. Dagnan & Cairns, 2005). Could empathic stance increase model’s predictive power (based on Betancourt, 1990)? Could empathy link situational and dispositional models of caregiving behaviour? Highly significant correlations (i.e. many at sig. level) with MRC subscales. Pattern of correlations supports our interpretation of factors. Significant correlations (mainly at 0.01 sig. level) with IRI subscales. 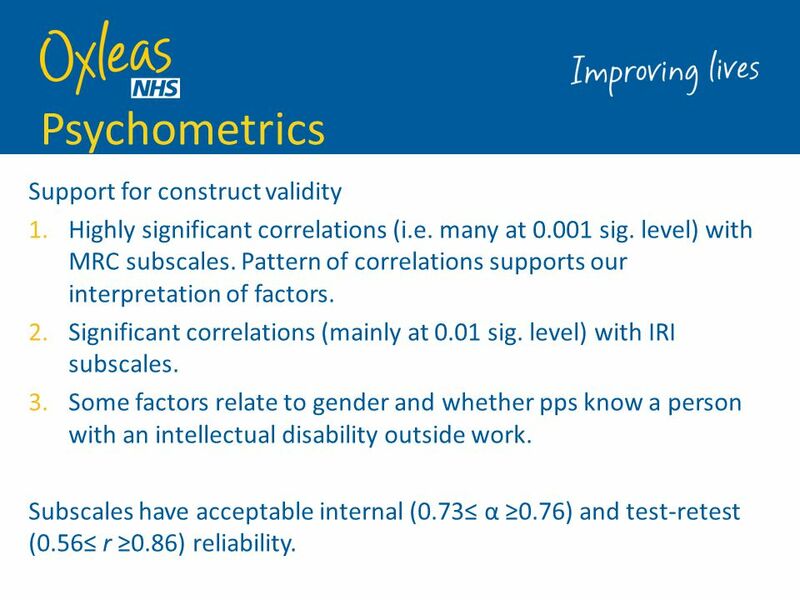 Some factors relate to gender and whether pps know a person with an intellectual disability outside work. Subscales have acceptable internal (0.73≤ α ≥0.76) and test-retest (0.56≤ r ≥0.86) reliability. 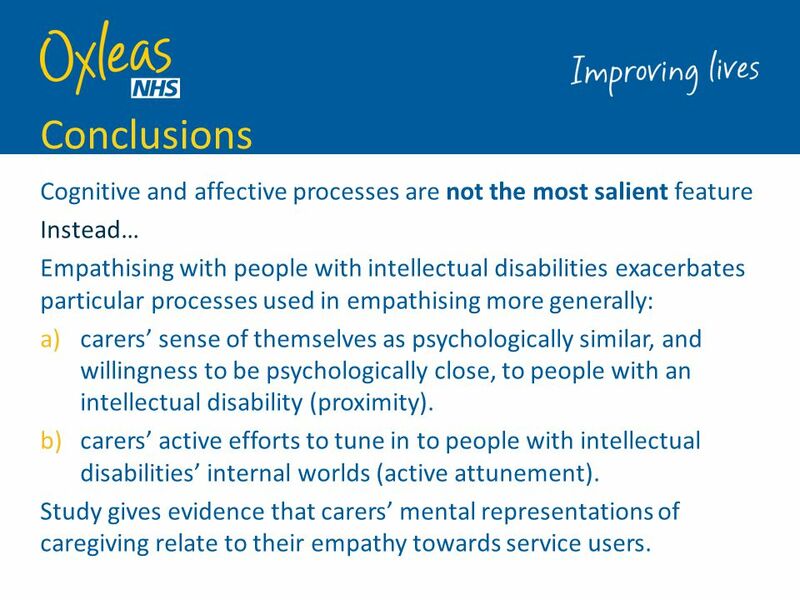 10 Conclusions Cognitive and affective processes are not the most salient feature Instead… Empathising with people with intellectual disabilities exacerbates particular processes used in empathising more generally: carers’ sense of themselves as psychologically similar, and willingness to be psychologically close, to people with an intellectual disability (proximity). 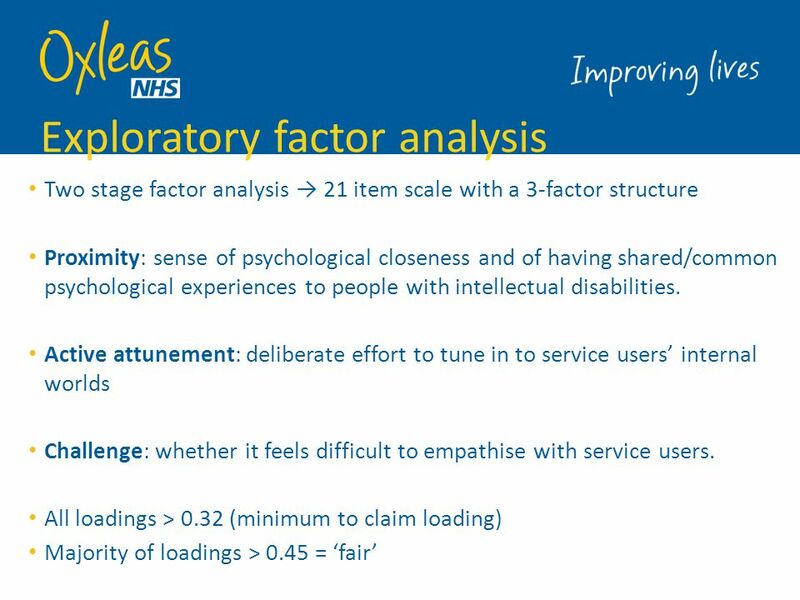 carers’ active efforts to tune in to people with intellectual disabilities’ internal worlds (active attunement). 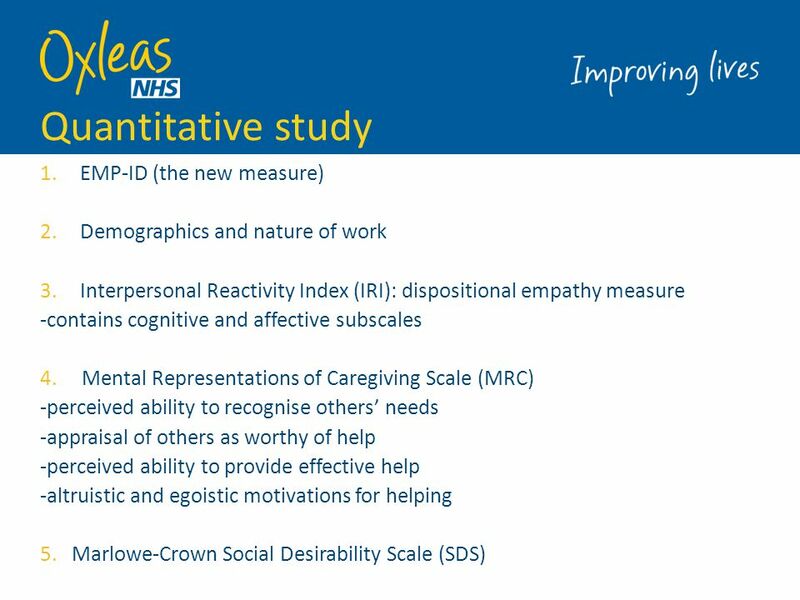 Study gives evidence that carers’ mental representations of caregiving relate to their empathy towards service users. Accounts for 34% variance i.e. other unmeasured influences on empathy. Challenge items all negatively worded: did they cluster because of wording? Correlations are highly significant but weak i.e. small effects. Variance in Active Attunement scores could result from individual differences in tendency to respond in a socially desirable manner. 25% response rate i.e. 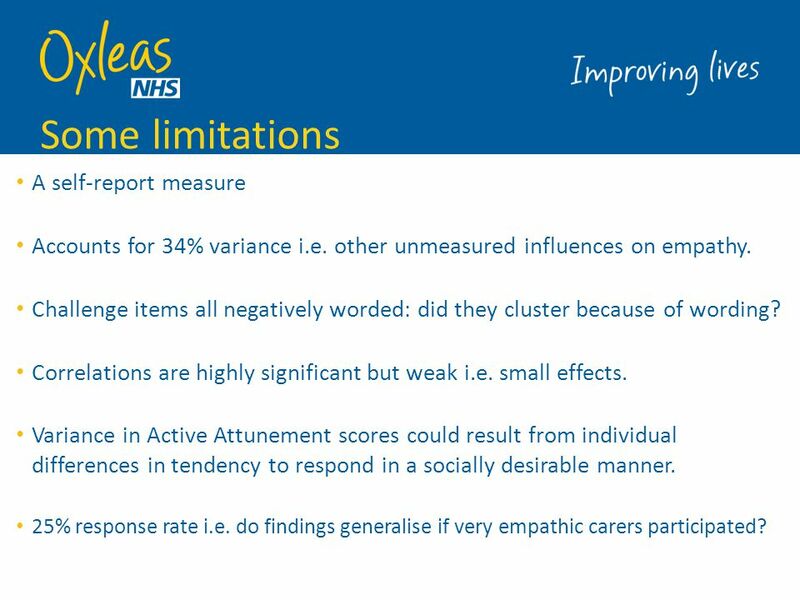 do findings generalise if very empathic carers participated? 12 Future research How does self-reported empathy relate to actual feelings/demonstrations of empathy ? 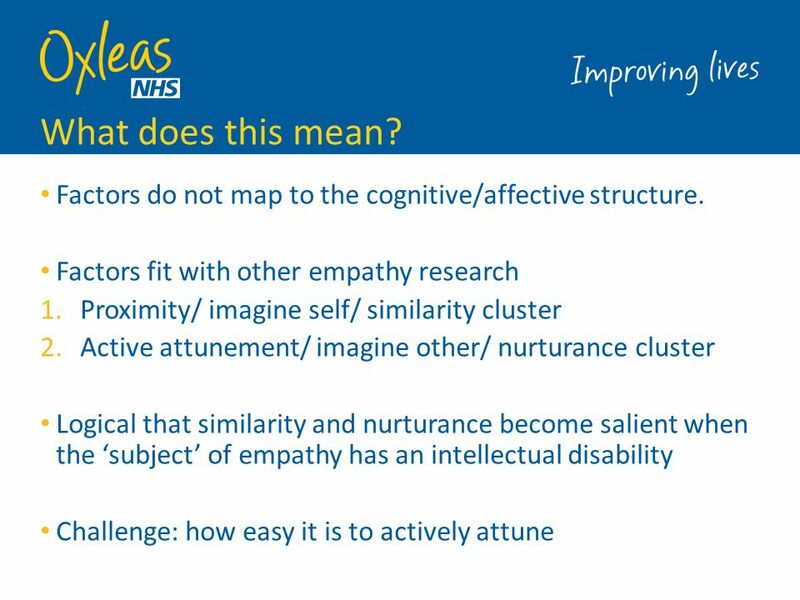 Clarification of the nature & determinants of the empathy clusters. 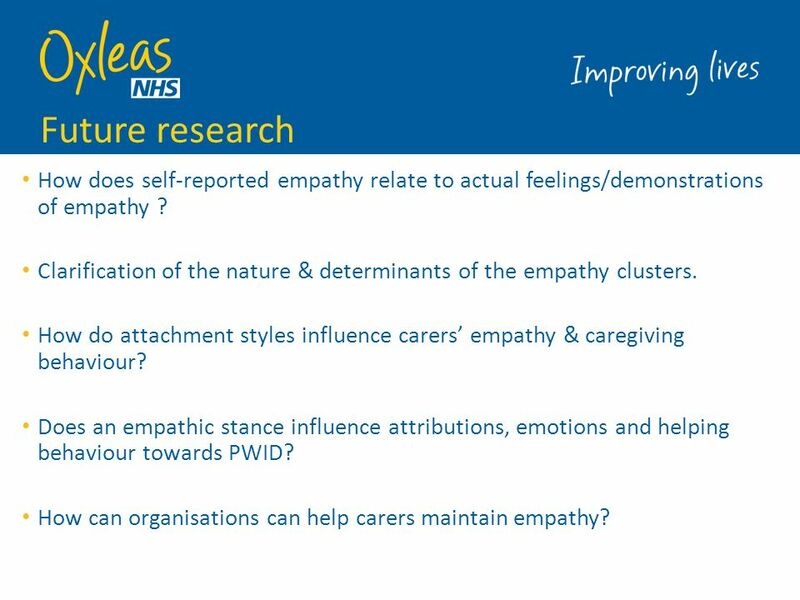 How do attachment styles influence carers’ empathy & caregiving behaviour? Does an empathic stance influence attributions, emotions and helping behaviour towards PWID? 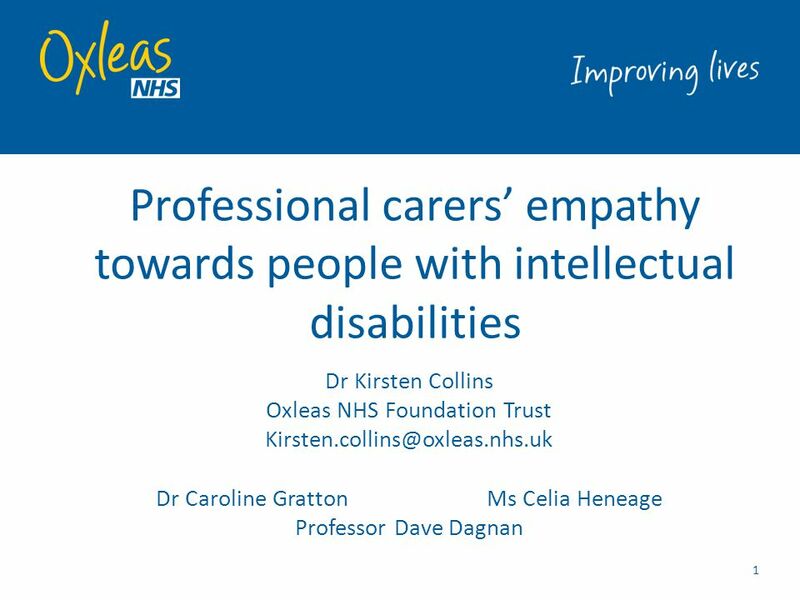 How can organisations can help carers maintain empathy? 14 A (partial) recipe for empathy? 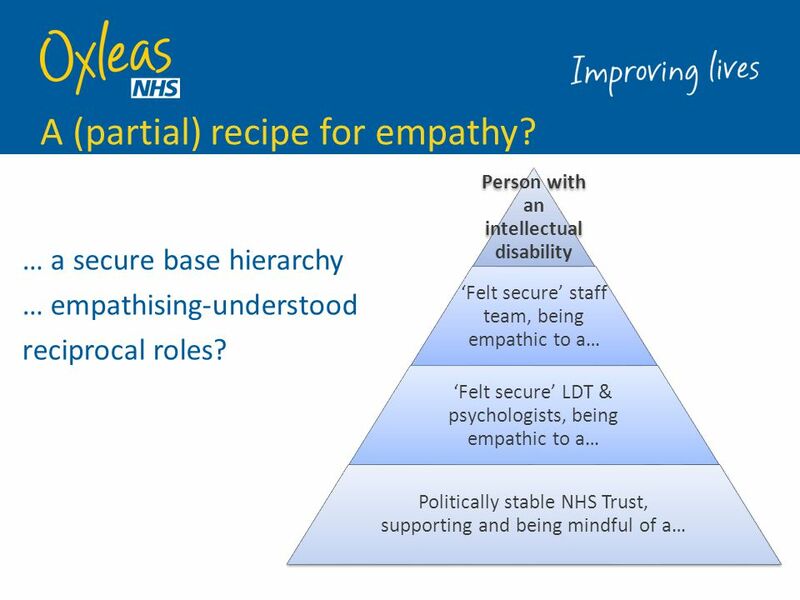 Person with an intellectual disability ‘Felt secure’ staff team, being empathic to a… ‘Felt secure’ LDT & psychologists, being empathic to a… Politically stable NHS Trust, supporting and being mindful of a… … a secure base hierarchy … empathising-understood reciprocal roles? 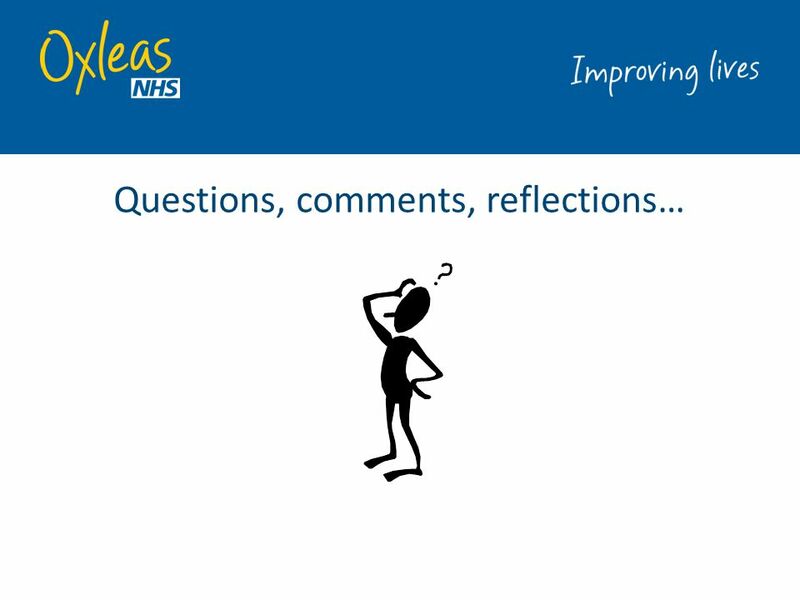 Download ppt "Dr Kirsten Collins Oxleas NHS Foundation Trust "
Organizational support and safety outcomes: An un- investigated relationship? Kathryn Mearns & Tom Reader Industrial Psychology Research Centre University. Presented by Isabelle Trowler, Assistant Director Childrens Social Care. Intro to LPA Feb 11©2011 EDAC All Rights ReservedSlide 1 The Executive Development Assessment Centre Introduction to the LPA February 2011. 1 The influence of the questionnaire design on the magnitude of change scores Sandra Nolte 1, Gerald Elsworth 2, Richard Osborne 2 1 Association of Dermatological. Promoting Regulatory Excellence Self Assessment & Physiotherapy: the Ontario Model Jan Robinson, Registrar & CEO, College of Physiotherapists of Ontario. Training to care for people with dementia WA Dementia Training Study Centre WADTSC Training support Skills development Competency Assessment Scholarships. The role of executive function and attachment styles on autobiographical memories of relationships Sezin Oner & Sami Gulgoz Koc University Istanbul.Turkey. Effective involvement in mental health services: the role of assertive outreach and the voluntary sector Bristol Mind. Working Models Self in relation to others.. Working Models  Primary assumption of attachment theory is that humans form close bonds in the interest of. Training and supervision in delivering the START intervention Dr Penny Rapaport Clinical Psychologist UCL. Exploring links between expressed emotion, challenging behaviour and burnout in learning disability frontline staff. Emma Mc Donnell.